Endlich, bin ich in Deutschland! I’ve been learning German for about a year and a half now, and finally I can visit this wonderful country. There has been many other attempts to visit Germany, but there were some not-so-ideal reasons why I didn’t visit (let’s not get into that). End of the day, I’m a free soul so I should be entitled to visit any country I wish. And this time, I’m bringing my mother! Growing up, my family has always emphasized on being cultured in classical music. I started playing piano since I was 7, and ended up learning the violin and the flute. We took long road trips, but instead of listening to the typical road trip music, I was listening to Bach, Beethoven, Mendelssohn, and Schumann. I played pieces from all of these composers so I was well aware of the melody and the stories they told. Even Mozart, though he’s not German he began his world tour starting in the palaces of Munich. My mother had already visited Vienna last year, but she was thrilled to be able to go on a trip in Germany. Bavaria is the perfect destination as it was rich in history, unique little towns, and spectacular castles and palaces. We planned to see 3 places in Bavaria: Munich, Neuschwanstein Castle, and Rothenburg. Another great reason is the food and the beer. You do not know what good beer is until you’ve been to Bavaria. And the wonders they can do to pork and potatoes in Bavaria is just amazing. Despite the hiccup in exiting Morocco and my flights to Germany, I made it with just a 4 hour delay from my original schedule. Landing in Germany was such a pleasant experience because the scenery was just stunning – Lush green fields and trees with clean cut farm land. I didn’t need to go through immigrations as I was flying within the EU, and luggage was quick, so I was on the train into the city in no time. Even going through the city on the train was a pleasant experience, the outskirts and nature of Munich was beautiful. I arrived at Munich Hbf (Hauptbahnhof = Central train station), and wow the station was just stunning. It was a high ceiling station with about 16 platforms and there were trains from everywhere in Europe. I wanted to jump on any train so badly, and just see where it takes me. Train travel is one of my favorite things to do while on holidays, because you get to meet people and just enjoy the scenery. My mom was already waiting in the hotel room when I entered. She had arrived just 5 minutes before me but I saw the small round glass coffee table covered with cherries. I’m not sure if I started the Instagram thing, or I actually got it from her. We faffed around for a few minutes settling in, and I opted for a long flowy dress and headed out for dinner near the Rathaus (Townhall). It got cold really quickly, I underestimated summer nights in Germany. We soon found an brewery that served Hof Bräuhaus or HB as well as Augustiner (Brewery restaurant name: Schneider Brauhaus). Augustiner is one of the best beers in Bavaria, and this brewery is Munich’s oldest independent brewery, est. 1328. The food is also amazing, I had a taste of the pork belly and some sauerkraut. I was instantly addicted to Bavarian food, I didn’t know you could make so many dishes out of pork. Originally, I was going to explore city center Munich for a bit. But because of arriving late, that’ll have to wait till Monday. Over the weekend, I split my time between Neuschwanstein Castle and Rothenburg. I will cover those in my next posts, and continue onto what you can see in Munich city center in one day! Although I’m not a religious person, I do really love the architecture of Churches. As all places of worship, the designs are breathtaking and especially the interior. Each of these churches have their own styles, some built in the romantic ages, others in a Gothic style. We left the hotel early at 8am so we could get into the churches before the crowd gets there. This is the most iconic landmark in Munich. You will instantly recognize it, and be at awe of its design. 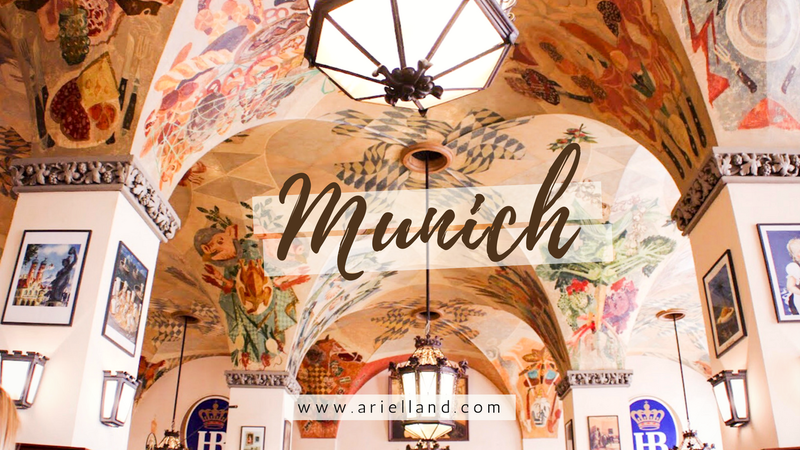 You cannot miss this Gothic style new townhall in the city center of Munich. It sits in Marienplatz where a lot of people gather for shopping and restaurants. There's a tower where you can go up for €2.50 for an amazing view of the city. However, most tourists don't take the time to wander around inside the townhall. One of its beautiful highlights is the Juristische Bibliothek, or legal library. Photos aren't allowed inside but it is worth to take a peak. Other than that, the inner walls of the townhall is line with stained glass windows overlooking into the courtyard. It's so amazing that this city has kept its tradition and culture so well! It’s a shame that most tourists stay outside for photos and don’t take some time to explore and wander around inside. And last but not east, the famous Glockenspiel. It plays at 11am, 12pm and 5pm (Summers) every day. Especially it is a gigantic cuckoo clock, with 43 bells and 32 life-sized figures that spin around the top of the tower. It lasts for about 15 minutes, so Marineplatz is at a standstill during those times. I absolutely love this place. Why? You can basically take photos inside a royal palace! What annoyed me on this trip was that I spent £16 to get into St.Paul’s Cathedral, when I spent €13 to get into Neuschwanstein castle, no photos are allowed. But, Residenz Munchen was only a €11 for a combination ticket which gets you into the main halls (130 rooms), and the treasury. You could easily spend hours in here and at your own pace with an audio guide. Every room has its own purpose, from dining to music room, chapel room, counselor's room... basically a room for everything. You can to see how Bavarian Kings lived in their lives, what items they used, and the amount of riches they accumulated. Recommended by our tour guide, Augustiner Bräustuben was packed full at 8:30pm. There was no room downstairs where all the action was, the band, the singing, the tipsy Germans. You could even hear it from the terrace upstairs! Augustiner is one of the best beers in Germany, and along with it I had a plate of various sausages, a cheese platter, and a traditional Bavarian beef soup. This is the true Bavarian experience!